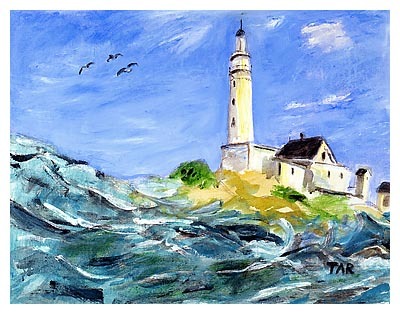 "The Lighthouse" is a fantastic oil painting created by Laszlo Tar in 1994. This work was created as a gift, especially for a neighbor who lived next door to Mr. Tar, in his Huntington, Long Island home and studio. The neighbor was an avid collector of lighthouse miniatures and Laszlo Tar wanted to add his art to his joy. After the death of the neighbor, the family returned the work to Mr. Tar, with special personal thanks for his kindness and friendship. The scene is of an imaginary lighthouse off the shores of Long Island. The incredibly rough seas and wonderful blue sky make this oil painting a true gem and very unique in Laszlo Tar's collection.